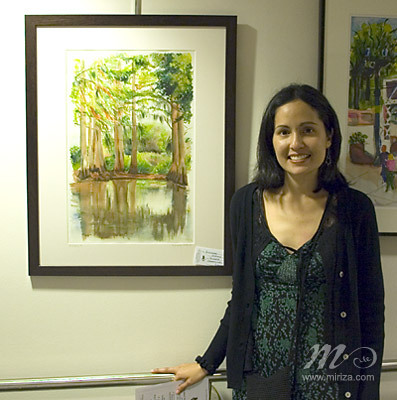 Michelle with one of her paintings at the Museum. Two selected watercolor paintings, Kissimmee Wetland and Capilla del Cristo, were submitted to the 23rd Open Juried Exhibition of the Palm Beach Watercolor Society, held at the Coral Springs Museum of Art. Over 100 pieces of art were on display in the Lobby Gallery of the beautiful musem, located in the city of Coral Springs, Florida (Northwest of Fort Lauderdale). The exhibition ran from March 1-25, 2006. The juror of this exhibition was Maria Bacinich, AAS, BFA.